The proliferation of forensic soaps on TV has not only given us some great characters, but promoted a quest for proof. Politicians are alert to voters’ instinctive search for evidence, but are adept at confusing simple questions. Consider the economy. The most sensitive human organ is the hip pocket nerve, and every voter puts economic management close to their top ballot test. Not surprisingly, Government and Opposition are now arguing over their economic credentials. Each cites data from different decades, which given the epochal changes between terms in office, makes forming a sensible judgement on this basis unrealistic. Voters with a serious interest in the track record of governments as economic managers may prefer a different test: how did Australia’s economy perform under the current and previous governments relative to the performances then of comparable economies? This recognises the reality of globalisation, and that domestic economies must be managed in light of offshore developments. It also recognises the cyclical nature of the global economy and eliminates good or bad forces that were unique to the times and beyond the control of the Australian government. I propose to use five standard measures of economic performance to answer this question: growth in gross domestic product; inflation; money market interest rates; unemployment; and the exchange rate. These, respectively, cover performance of the economy as a whole in terms of its growth, and success in containing price pressures which are usually accepted as detrimental to sustained growth; voter’s 'misery index' of interest rates plus unemployment; and a measure of financial performance relative to other nations. The yardstick nations are our close neighbour New Zealand, major trading partner the United States, and Canada and the Netherlands, which are similar in size and culture to Australia and seem (to me at least) well governed. The critical test for each government is: during its term in office, how did Australia’s economy perform relative to international yardsticks? This will be measured simply by the change in each of the five indicators between the calendar years that bookended the terms in office. 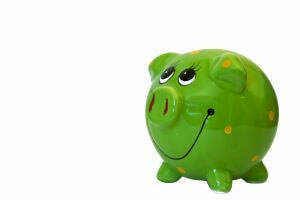 The intuition is that this reflects relative economic improvements achieved by the government whilst in office. Two periods will be covered: the Hawke-Keating government from March 1983 to March 1996 (that is, changes between calendar years 1983 and 1996) and the Howard government from March 1996 to June 2007. The table shows the results which — to ensure consistency — use data sourced from the International Monetary Fund publication International Financial Statistics. 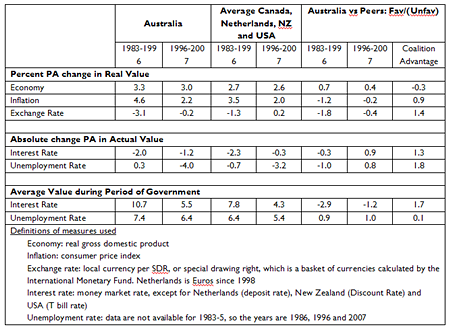 In brief, comparison of the economic performance of the Hawke-Keating and Howard governments relative to other economies at the same time shows that the Howard Government delivered: lower inflation, interest rates, and unemployment, and stronger exchange rates; but weaker economic growth. The current government has outperformed its predecessor on thee criteria and underperformed on one. It also delivered a stronger currency, which is outperformance for importers and Australian tourists, but underperformance for exporters and foreign visitors. Not surprisingly, changing the comparison criteria affects the results, but leaves the broad conclusion unchanged. For instance, removing the Netherlands makes the comparison move favourable for the Hawke-Keating Government; and removing New Zealand improves the relative performance of the Howard Government; but the changes are only slight. Fiddling with the start and end dates also shifts the relative advantages, but not substantially. Qualitatively each of the comparison bases leads to the same conclusion: the current Government has the better relative economic record, but not unequivocally. Intuitively the mixed record of the current and previous governments should not be a surprise. If the Government or Opposition had a demonstrably superior track record they would have long since placed it proudly on display with a knockout blow. The most significant point of distinction is on interest rates, which is why the Howard Government is using this legacy as one of its strongest weapons against the Opposition. This leads to a much more complex question. Given the probable early departure of key Howard ministers and scant continuity in Rudd’s team from the Hawke-Keating ministry, voters seeking the better economic manager need to decide on which of the candidate governments is more likely to prove at least the equal of its predecessor. Numbers are of little help here. The fact that the Howard Government’s fiscal policy is currently being steered by a drunken sailor should alarm all of us who detest pork barrelling, waste and uncosted commitments. Kevin Rudd’s lack of experience and seeming inability to come up with his own economic policies makes it impractical to judge his expertise and likely stance if in government. On the other hand, both Government and Opposition seem committed to economic reform, which — of course — is the best way to outperform competitor economies. In summary, voters keen to choose the better economic manager will need to scrutinise the policy fine print and evaluate the economic expertise of the leader (including possible Howard successors). An important judgement is the ability and determination of the party to deliver on its policy and not suddenly find some reason to backtrack. Unfortunately choosing an economic manager based on track record seems no easier than using track record to choose the better party for foreign affairs, social security and other key policy areas. Recent articles by Les Coleman. Sorry, Les, but not every voter 'puts economic management close to their top ballot test'. I'm one that doesn't. I look at it this way. Lets say the Australian economy now is at 100, and with change of government it might, for the sake of argument, drop to 95. Indonesia's is at, say, 40, PNG 30, East Timor 20. The 100-95 difference is trivial; the 100-40 etc differences are the important one, that our government should be doing its best to reduce. It seems to me that governments now think their job is to run the economy, whereas once upon a time they thought it was to run the country. Then they wanted to have useful property, like banks and airlines and railways and a CSIRO. Now they sell those things and just have money, and they think the country is rich.